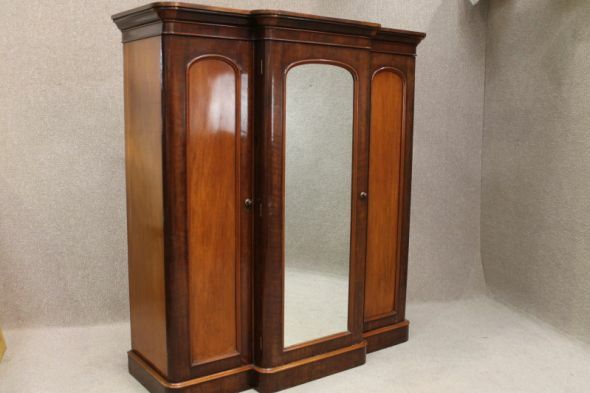 A beautiful circa 1880 large mahogany compactum antique Victorian wardrobe. This piece comprises of full length hanging space to right hand side and left hand side, and a large cheval mirror door to centre which opens up to reveal numerous slides and drawers. This is an extremely useful piece of furniture. The item breaks down into five individual pieces for ease of transportation and reassembly. It is in good condition for its age considering that it may have been moved many times. An impressive piece for any period property with just the general wear and tear for an antique piece of furniture.